Another school year is headed to the finish line! With more than 9,000 public and private K–12 schools in Texas – and nearly 150 higher-education institutions – chances are someone in your circle will be walking the graduation stage in May. 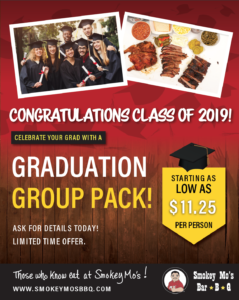 Mark the milestone with a graduation party, featuring a scrumptious feast from Smokey Mo’s BBQ! Our “Grad Pack” specials are available at each of our 16 central Texas restaurants or for delivery through Door Dash or Uber Eats. The diploma: With the diploma, it’s official! Academic mission accomplished. Until a century ago, diplomas were made of paper-thin sheepskin – hand-written, rolled, and tied with a ribbon. Now they’re typically printed on parchment and presented in leather binders. The cap and gown: Traditional graduation attire, the cap and gown date back centuries to the early universities in Europe. The cap is also called a “mortarboard” and resembles the headgear once worn by church dignitaries. The tassel. The cap tassel is displayed on the right side of the cap and shifted to the left when grads receive their diplomas. Cap throwing: At the end of the graduation ceremony, grads typically toss their caps skyward, signaling their flight to whatever awaits them. The tradition started in 1912 at the U.S. Naval Academy and soon spread. Congrats, Texas grads! Smokey Mo’s wishes you a fabulous future!